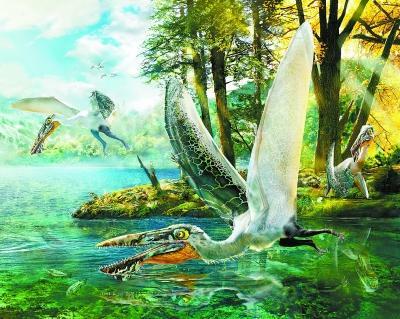 Fossils of a 120-million-year-old winged reptile found in northeast China are enjoying celebrity for a resemblance to the aerial creatures "ikran" from James Cameron's movie "Avatar." Fittingly named Ikrandraco avatar, the new pterosaur was found in Liaoning Province by a team led by vertebrate paleontologist Wang Xiaolin, according to a Friday statement from the Institute of Vertebrate Paleontology and Paleoanthropology of the Chinese Academy of Sciences (CAS). Based on fossil analysis, Wang's team concluded that the new species had sharp teeth, a flat and elongated skull and a blade-like bulge of bone on the lower jaw -- features shared with the "ikran" in the sci-fi blockbuster. It also had a throat pouch like that of a pelican. The new find, with a 1.5-meter wingspan, is much smaller than its cinematic look-alike. Related to dinosaurs, pterosaurs lived between 225 million and 65 million years ago. The ikran was fashioned after the largest known pterosaur with a wingspan up to 12 meters. Two fossil sets of the species were found -- a rare feat in pterosaur discoveries -- in a geological formation rich in fossils from the early Cretaceous era 120 million years ago. The discovery was published Thursday on the journal Scientific Reports. According to Wang, the creature's skull feature are unknown among the pterosaur species. Its sharp, semicircular mandible could reduce air resistance. Wang suggested that the animal flew close to the water surface with its jaw crest cutting through the water when hunting. Its throat pouch might serve as a store for its catch.